Last week, I had a conference in Albuquerque, NM. The day I was to drive was filled with winter weather advisories, so I decided to leave a day early (after having worked the night before and having NO sleep!). 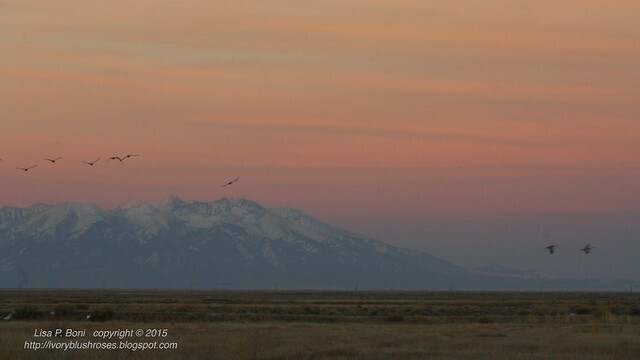 Though I encountered heavy fog for about 150 miles, the drive to Raton, NM wasn't bad and the following morning, I rose before sunrise and continued the journey south trying to stay ahead of the snow. By 8:00 a.m., I was in Santa Fe, NM with mostly clear blue skies and had managed to miss all the snow! 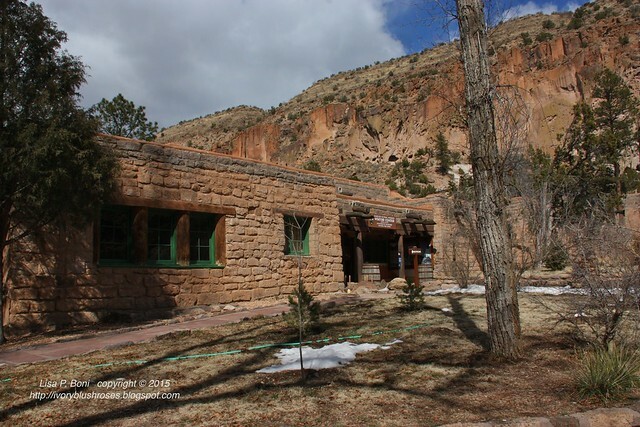 With an unexpected day free to explore, I headed to Bandelier National Monument in the mountains north west of Santa Fe near Los Alamos. 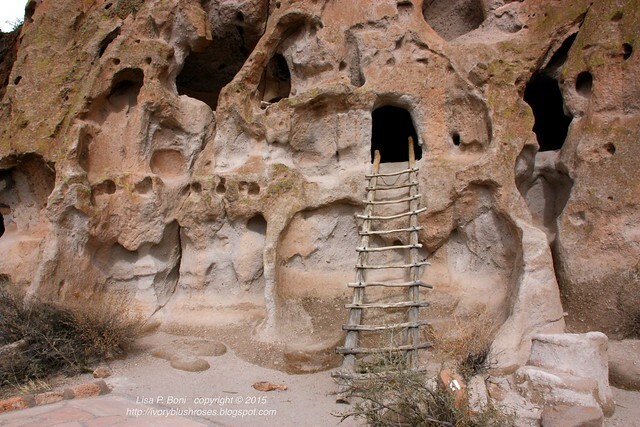 Here, in a steep walled crack of a canyon, their are indian ruins carved into the soft Tuff cliff walls and the foundations of many roomed pueblos as well as some petroglyphs carved into the cliff walls. The visitor center was lovely and set just the right mood for the walk to come. At one time, it was a hotel. Now the rooms house the visitor center and many of the Monument staff who come to work here and help to preserve the ruins. 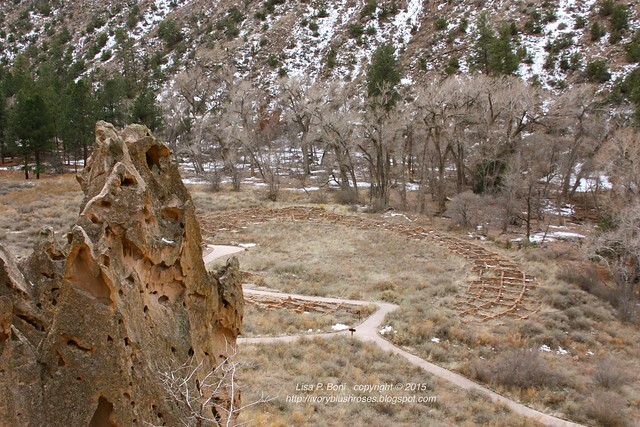 The trail winds through a large circular ruin of many rooms and several kivas before heading up to the cliff walls. The cliffs are made of Tuff, which is actually compressed volcanic ash. Many, many feet of compressed volcanic ash! It is soft and easily carved, so their are many rooms carved into the cliff face as well as places where rooms were built out in front of the walls. In places, water has carved the walls into amazing forms. In a few places, they have placed ladders, which you may climb up to visit the interior of some of the rooms. I must admit that being not fond of ladders, having knees that don't like ladders and carrying too much photographic equipment, I did not try the ladders. After visiting Bandelier, I followed the road up into the mountains above the canyon to see the remnants of the volcano that spewed forth so much ash. 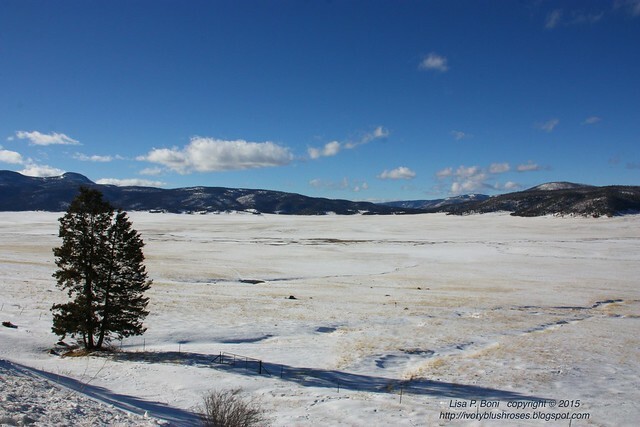 This broad mountain valley known as Valles Caldera is 12 miles wide and is what is left of the massive eruption that left over 90 feet of ash in some places! The thought is that when this volcano blew, it spewed over 500 times the amount of ash, rock and debris that Mount St. Helens did during its eruption! Wow! On this sunny, wintry day with the valley floor covered with snow, it's hard to imagine what that that eruption must have been like. From there, I headed south toward Albuquerque where I attended the conference. I heard from many people that they had made the drive through the snow and that it was a difficult drive, so I was very glad to have made the drive a day early, even if it was on little sleep! After the conference, I made my way north to Monte Vista, Colorado. 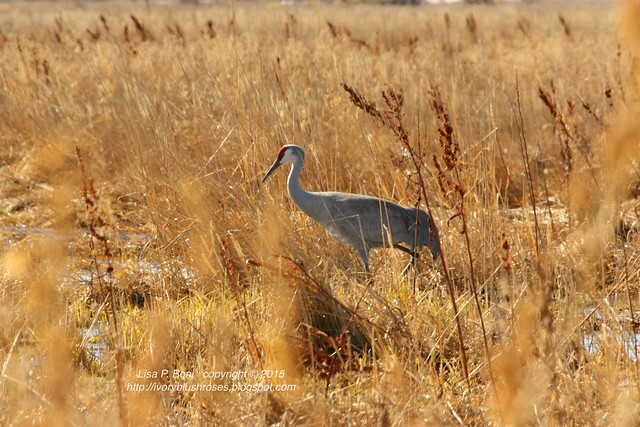 There is a National Wildlife Refuge here and each spring (and again in the fall, but on a lesser scale), the Sandhill Cranes stop on their migration north to fatten up for their journey and the breeding season to come. Most of the ponds were still frozen, but beautiful none-the-less. 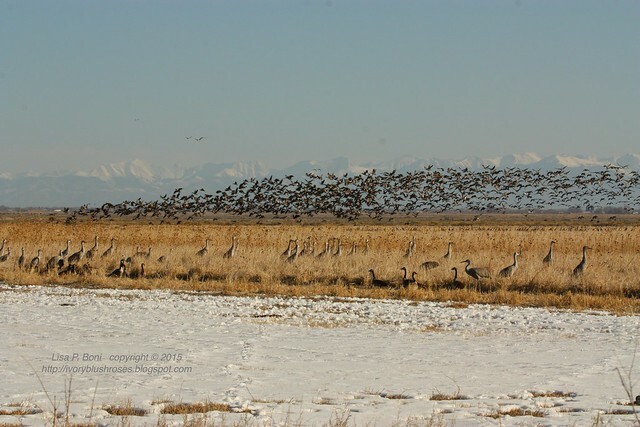 In addition to the cranes, who stand about 3 feet tall, there were thousands of Canada geese and a myriad of duck species. At times the sky was simply filled with birds of one type or another! The sound was amazing. 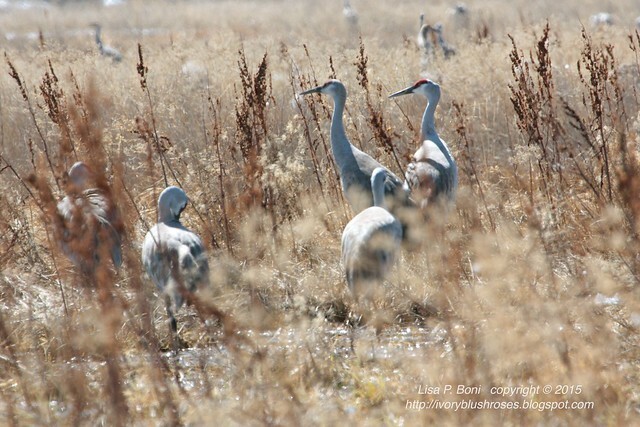 The cranes have a loud "kra-a-ack" call that reverberates for miles, especially when in flight. The red tops of their heads really shows up in the sunlight! For such large birds, they are graceful in flight as well. 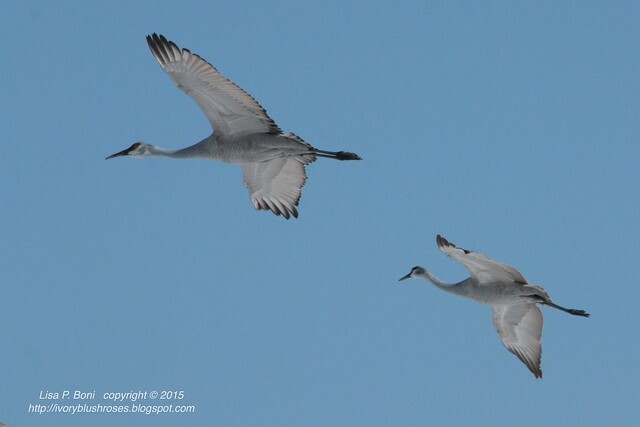 Their feathers create a unique whiffling sound as the move through the air and they call continually while aloft. 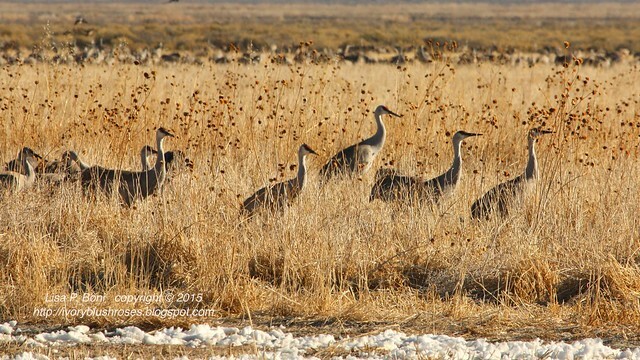 The cranes mate for life and usually raise one young, so most often, they are found flying in groups of two or three dependent on whether or not they've kicked the youngster out of the family group yet. Early in the morning or in the evening, they take to the air in larger groups as they move to/from feeding/resting grounds to nightly roosting spots. 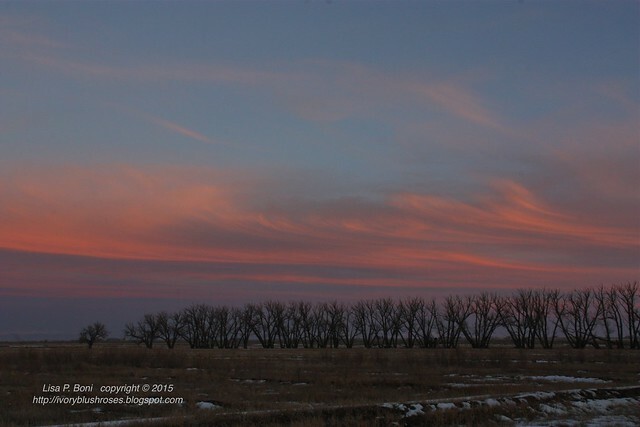 The sky was glorious that evening with sun-tinged clouds lighting up the sky and the dark silhouettes of trees in contrast. 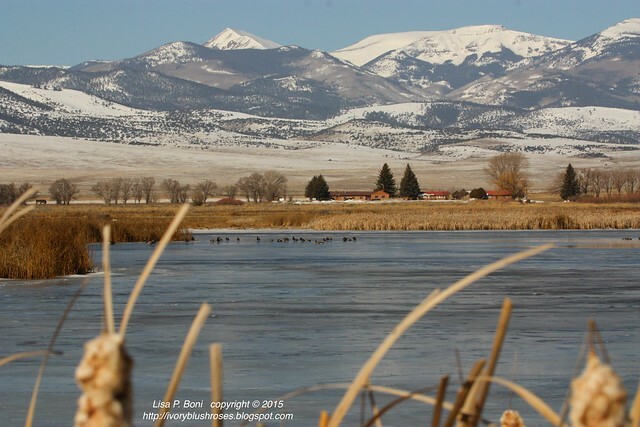 Across the San Luis Valley, Mount Blanca was the backdrop for more birds in flight. 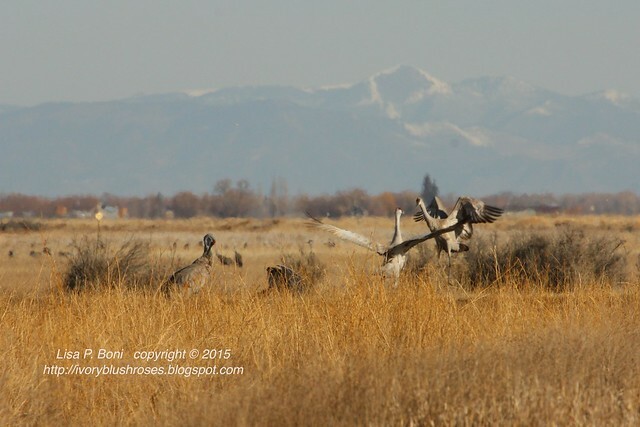 I got to enjoy two mornings at the refuge. Such a gorgeous spot! 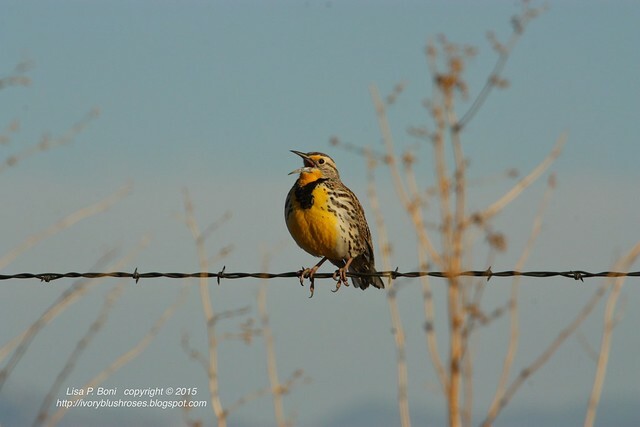 Having grown up on the plains just east of Boulder long before the area built up as much as it is nowdays, the song of the meadowlark was my morning wake up call. It's still one of my favorite bird songs and one I definitely associate with spring and summer. What a delight to catch this fellow singing so joyfully on this beautiful morning! I sat at this spot quite a lot watching the cranes as they foraged for grain dropped in the fields after last autumn's harvest. Suddenly, with a huge burst of sound, this enormous flock of Canada Geese, which had been silent until then, suddenly burst up into the air! I hadn't even realized they were there! Intriguing to think what brings an entire flock of thousands of birds suddenly into the air at exactly the same time! 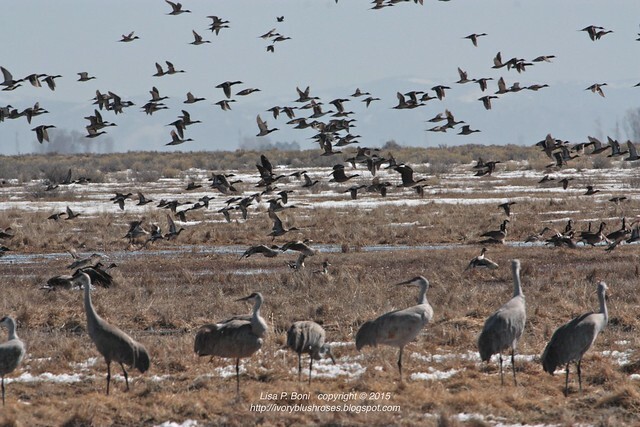 The cranes were unperturbed by all the excitement! At one point, I was able to witness some of the crane's dance. They leap and jump into the air as part of their mating rituals. They are magnificent birds and it was such a treat to get to spend a day and a half observing them! 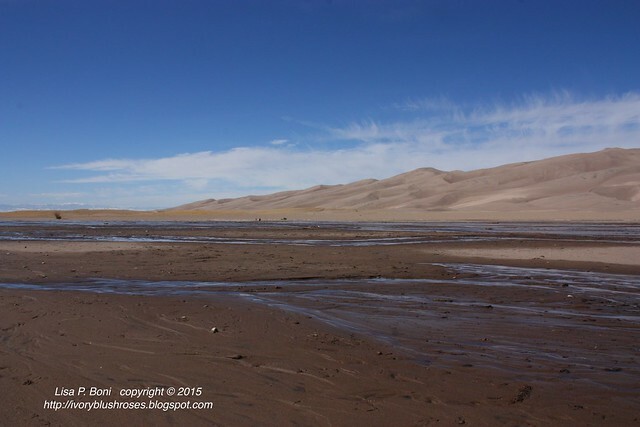 As I headed towards home, I decided to make a brief stop at Great Sand Dunes National Park. I'd been there as a child and again as a teenager... some 45 years ago, but hadn't made a stop there since then. The road turns north into the park at the foot of Mount Blanca or Blanca Peak as it is sometimes called. 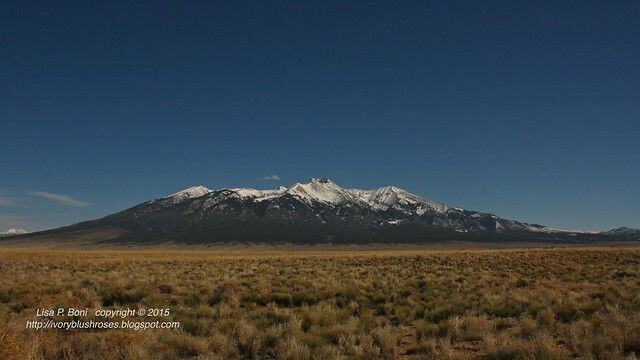 Mount Blanca sits mostly alone and is one of the four sacred "sky island" mountains of the Navaho. My Dad also loved this mountain and I believe he climbed to its 14,344 foot summit on more than one occasion. It's quite a climb as it rises more than 5,000 feet from the valley floor! Heading north around the west flank of Blanca Peak, one comes upon this band of tan sand dunes tucked in a crook in the Sangre De Cristo Mountains. 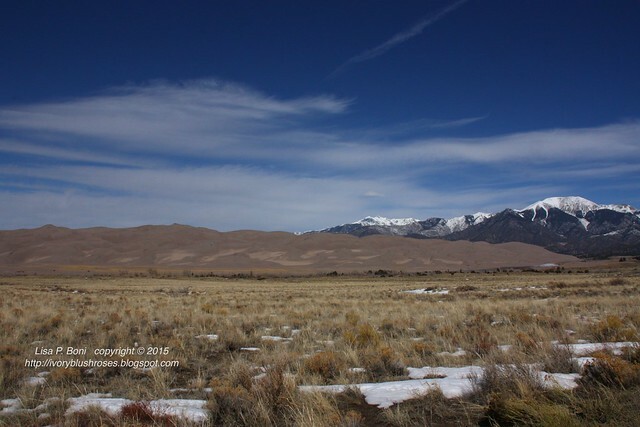 When I was growing up, this was a National Monument, but in 2004, it became the Great Sand Dunes National Park & Preserve. The dunes are the tallest dunes in the United States, standing up to 750 feet tall! 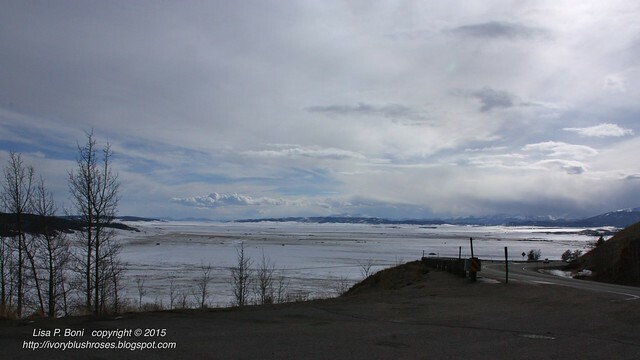 On the eastern edge, you can see across the broad San Luis Valley to the La Garita and San Juan Mountains on the far side. 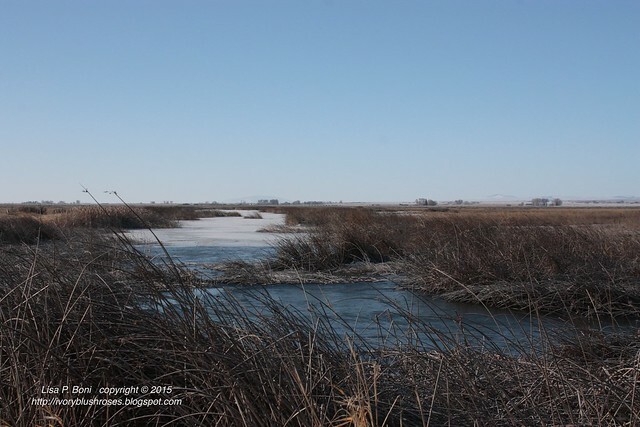 One of the things that helps to keep the Sand Dunes contained is Medano Creek. Right now, there isn't a lot of water as most of it is frozen. But as it melts during the day, it fans out across the southern boundary of the dunes. Later in the spring, it will become a much deeper creek and is a great spot for people to play in the water! I have fun memories of our 8th grade science class making a field trip here for a few days way back when! With time constraints for getting back home, I didn't climb the dunes, but I did spend time walking along the creek and enjoying the patterns of wind and water on the sand. 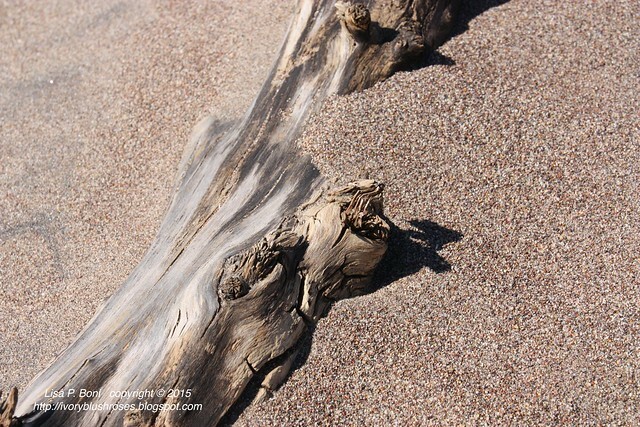 When picking up a handful of sand, I found it exceedingly light in weight and realized that this was one of the things that allows the wind to pick it up from all across the broad San Luis Valley and deposit it here in the crook of the mountains. 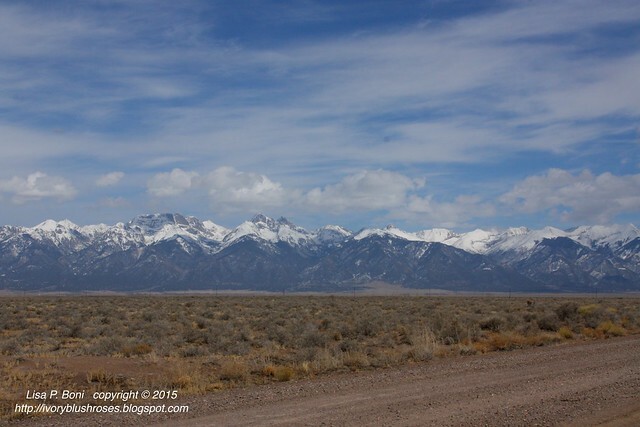 As I left the park, I headed north through the San Luis Valley and marveled at the peaks of the Sangre De Cristo Mountains. Stunningly beautiful. It's no wonder that my Dad thought that these were some of the most beautiful mountains in Colorado! 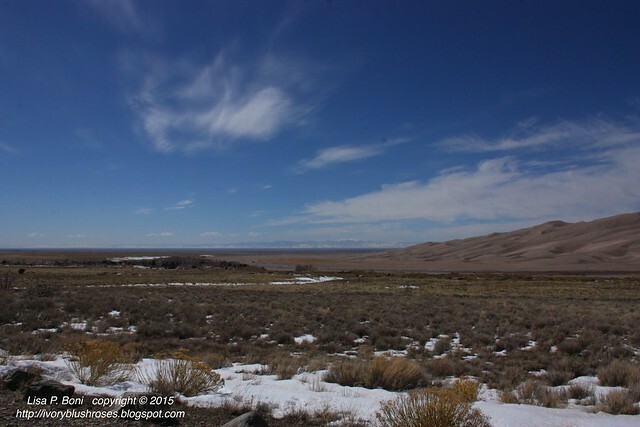 After leaving the broad low San Luis Valley, the road continues north and eventually crossed into the higher "South Park" valley. Yes, the same South Park as loosely featured in the rude comic strip of that name. The real thing is beautiful, though often windy and cold! I've driven the road through here in the winter, with the wind blowing the same direction as the car was traveling and had the ice form in forward pointing icicles! Some of Colorado's coldest temps are often recorded in this region and the wind, never seems to stop blowing! On this day, it wasn't too bad, but I was grateful to come up over the ridge on the north side and over into the Front Range of Colorado where it was significantly warmer! I arrived home in the early evening to the sound of robins chirping in the yard and the twitter-pated song of the sparrows and finches in the trees near my doorway! How quickly things can change in just a few short days - from winter weather travel advisories and snow to sunny, warm and a hint of spring in the air! What an interesting post, filled with wonderful photos and great info on these parts of the country. Just beautiful and I thank you for this little mini vacation from my chair. I thoroughly enjoyed it. What gorgeous photography! Thank you for such a lovely post!